Staff Sgt. Robyn Boatright, left, of Success, and Spc. Bobby Everett, of St. Robert, both of the 7th Weapons of Mass Destruction Civil Support Team, collect evidence during a Vigilant Guard exercise. CAMP DODGE, Iowa (June 23, 2009) — Mock meth labs and chemical train derailments were among the training events experienced by the 7th Weapons of Mass Destruction Civil Support Team, based at Fort Leonard Wood, during a June 18 and 19 exercise in Iowa known as Vigilant Guard. The Fort Leonard Wood-based Missouri National Guard unit was one of three civil support teams to train at the event, along with a plethora of local first responders, the Iowa National Guard’s Chemical, Biological, Radiological, Nuclear and Explosive Enhanced Response Force Package and several other government agencies such as the FBI. “The exercise also was good for us because we had to travel eight hours to Des Moines, Iowa, which tested our stamina,” White said. This team’s mission is to assess suspected or known terrorist threats, advise civilian authorities of appropriate responses, and assist local emergency responders in incidents involving weapons of mass destruction. The 22-person team, made up of both Army and Air National Guardsmen, must be capable of sending out an advance team within 90 minutes at all times to investigate potential hazards, including mass sickness, mysterious powders and unidentified contaminations. 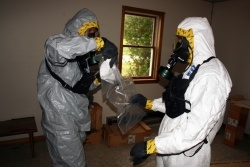 The team’s first exercise in Iowa involved entering a residence that contained a pair of suspected methamphetamine labs after the building had been cleared by a special response team — similar to a SWAT team — from Cedar Rapids, Iowa. Wearing personal protective equipment, Staff Sgt. Jamie Turner, reconnaissance team chief, and Sgts. Brian Harvey and Chester Romine made entry into the home. For Turner, who lives in Iberia, this will likely be his last full-scale exercise with the team after accepting a position as a readiness noncommissioned officer with Company B, 1-138th Infantry Battalion in St. Louis. The group, which wore level C Hazmat suits, discovered both lab setups and took samples from them to determine exactly what the substances were. After the group exited the building and performed self-decontamination, the exercise was called to a halt before the medical team got a chance to analyze the substances. Later that day, the unit was called to do a battle handoff with the 71st Civil Support Team out of Iowa at a simulated train derailment. Harvey said working with some of the other groups involved with Vigilant Guard was a positive experience. The unit’s mission was to determine if a possible weapon of mass destruction might have been released from a railcar and injured someone. Staff Sgt. Robyn Boatright, reconnaissance team chief, led her group, which included Sgt. Herbert Wolf and Spc. Bobby Everett, into the threat area wearing level A suits. They discovered their objective and were preparing to make their next move when the exercise was called because of safety reasons. “Our whole purpose of going into the threat area was to verify that there was a dead body and verify that two vials were in each hand of the dead body,” said Everett, who lives in St. Robert. Everett said stamina and patience were the main lessons he took from the training. Wolf said he was glad to get more time working with some of the team’s equipment and how to troubleshoot it. “Practice makes perfect,” he said. The team wrapped up its Vigilant Guard mission the next day when they were called to respond to another residence where suspected labs were located. Sgt. 1st Class Juan Gallego, recons noncommissioned officer in charge, and Everett took a quick look around the outside of the home in level C suits and distributed sensors around the structure that would test the air for contaminants. Turner and Wolf followed with an entry into the building where they discovered two labs, along with paperwork for making a potentially dangerous substance. The building had 14 rooms and a large basement, which made searching through it time consuming and challenging. Everett, along with Boatright, who lives in Success, returned to collect the papers to be gathered as evidence, while Turner, Harvey and Romine, who lives in St. James, took samples from one of the labs before the exercise was shut down because of severe weather. Harvey, who in the past had worked mostly with Boatright, said working with Turner helped expand his knowledge base. “Working with another team chief and seeing how they do things as opposed to the first team chief you had was interesting,” Harvey said. Everett said, overall, it was good training. “It was great because I got some suit time,” he said.